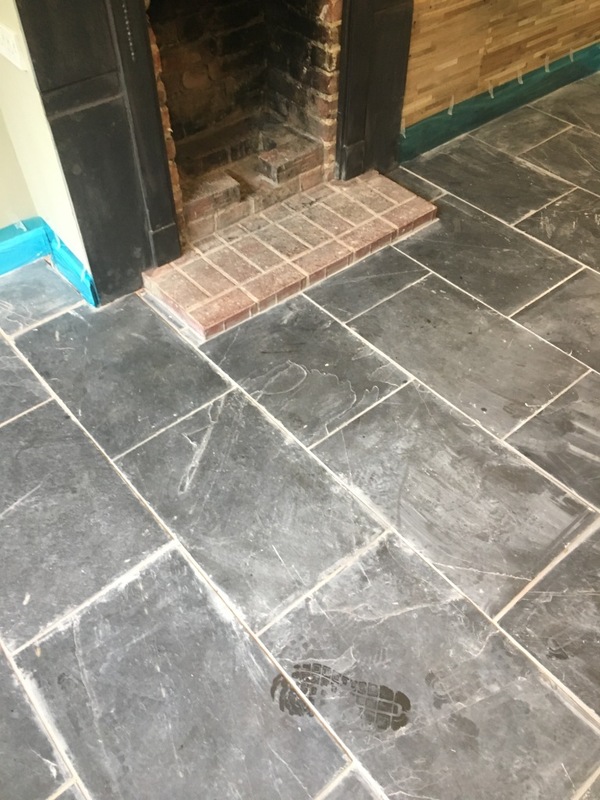 The photos below show what can only be described as a botched installation of a black Slate tiled living room floor by a non-expert builder. It may not be immediately obvious what the problems were – but the property owner was pulling his hair out with the situation (having spent a small fortune) as the floor was incredibly dirty. He decided to call us in to take a closer look at what could be done to put his mind to rest. This property was located in Bexhill, a large seaside town on the South East coast that is known for its abundance of Edwardian and Victorian architecture. We arrived at the property and, upon closer inspection, we could see that the floor was covered in unsightly marks. At first glance I thought it might be grout smears (aka grout haze) which is a fine powder that is meant to be polished off after tiling, but it was in fact excess grout that had been left on the tile and then to compound the problem sealed over. To make things worse the slate tiles had not been laid completely flat and there was a great amount of lippage between them. However, despite all the problems I was confident we could resolve the issues for the customer and we set a date to come back and do the work. On our return we set about covering the skirting boards with a thin plastic sheet to protect them from any splashing from cleaning products. 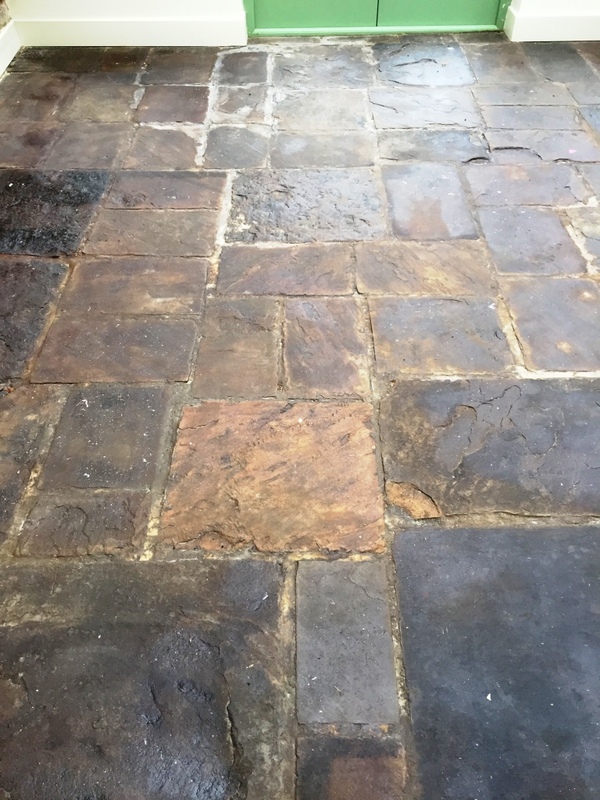 Once this was done work started on the restoration beginning with an application of Tile Doctor Acid Gel, which is a blend of phosphoric and hydrochloric acids that comes in a gel form that is easy to control. 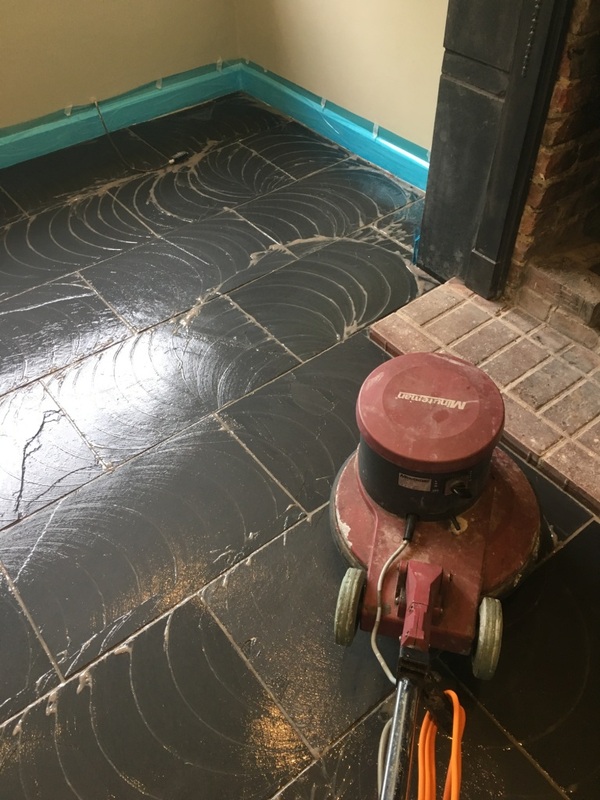 This is used to break down the existing sealer and – in combination with some diamond encrusted burnishing pads – to dissolve and grind away the excess grout which was marking the floor. The floor was then rinsed with water and the soiled solution extracted using a wet vacuum. 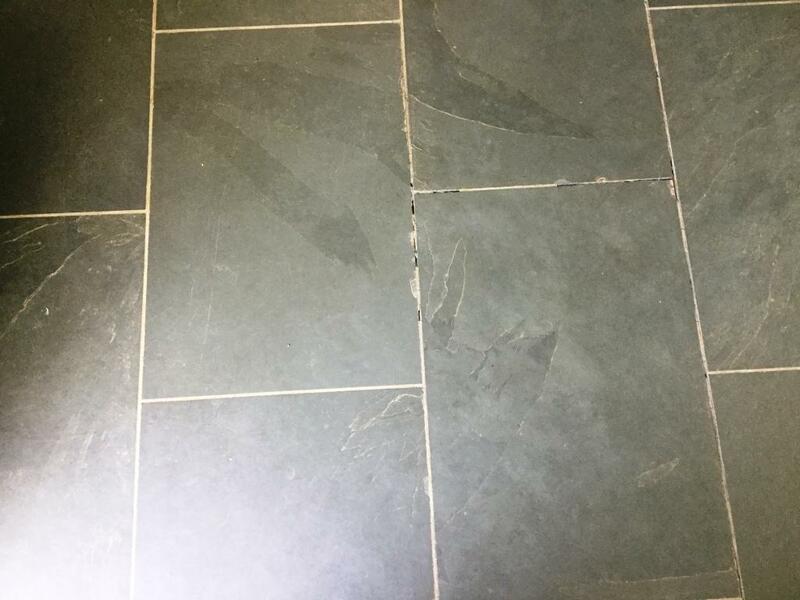 Following this the slate tiles were inspected and stubborn areas re-treated. It’s worth noting we would not take this aggressive approach on acid-sensitive stone such as Marble, Limestone, Travertine and some types of Terrazzo. We would use a more neutral cleaning product, combined with the burnishing pads. 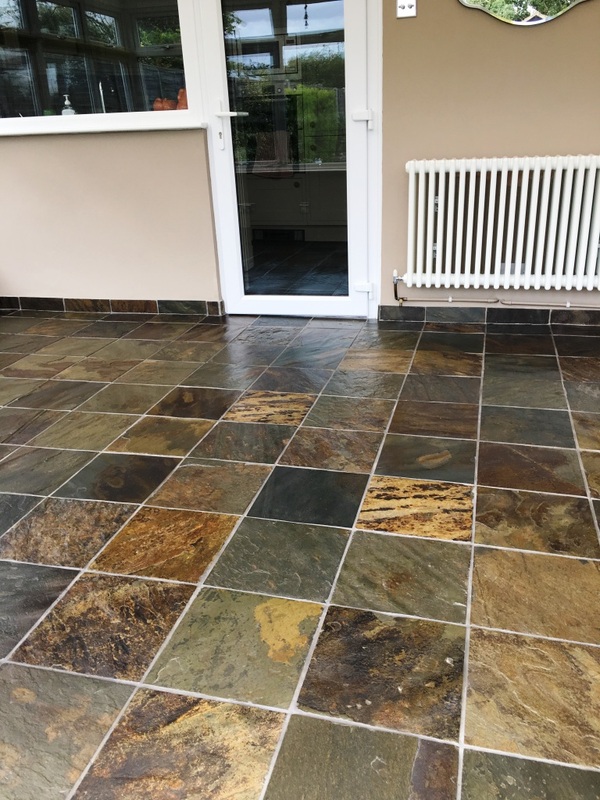 Acidic products can cause etching on these sensitive types of stone, but thankfully Slate is hard-wearing and is compatible with Acid Gel. The floor was left to dry completely over the course of two days. We then returned to apply a fresh seal to ensure the floor was be protected for the future. First, we applied Tile Doctor Stone Oil, which is an impregnating, colour enhancing sealer. It’s designed for low porosity stone like Slate and does a remarkable job of restoring the dark tones in the stone. Once this had dried it was followed by a couple of coats of Tile Doctor Seal and Go which adds a high-quality and aesthetically pleasing sheen finish to the tile. 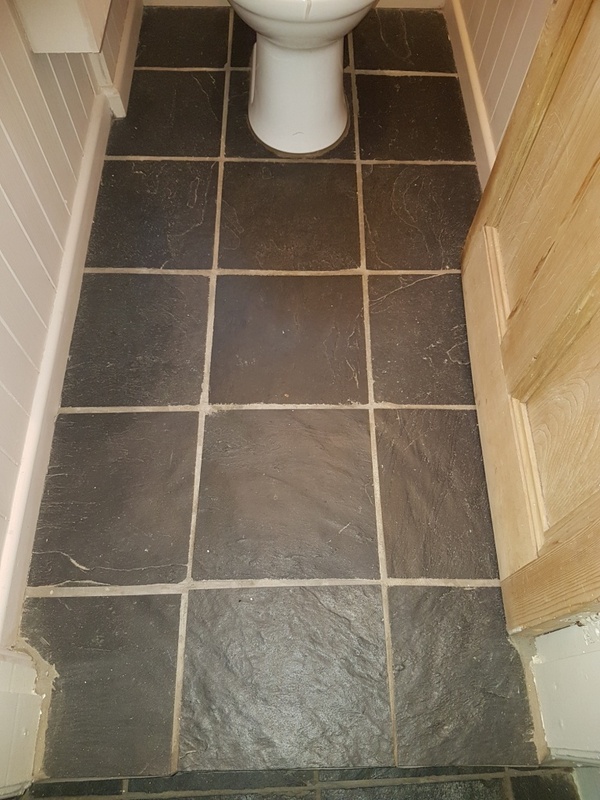 In the space of a few days, we were able to help the customer avert what initially seemed to be a crisis caused by amateur tiling. The customer was very relieved not to have to take a costly and drastic action like replacing the floor entirely. 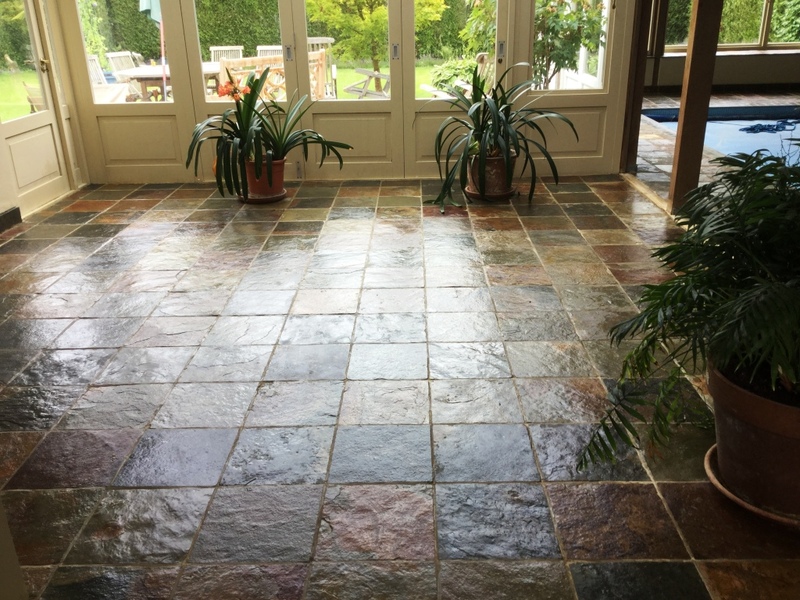 With the right products and cleaning methods, we were able to get these tiles looking the way they should have in the first place. Converting a barn into a property can be an exciting project, but it certainly doesn’t come without a range of challenges. If done correctly, they can look amazing and are well worth the effort. A recent customer of mine had spent the last six months converting a barn into a residential property in the West Surrey town of Farnham. While the project had been a big success, the house had been subjected to high traffic from dozens of carpenters, electricians and builders. 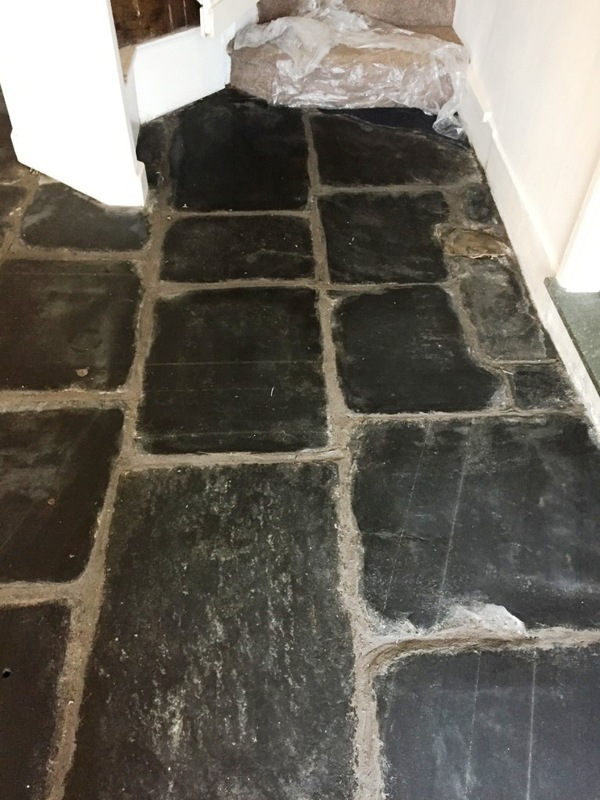 This had taken its toll on the newly installed Slate tiled floor – so the property owner asked me to restore it to its peak condition to complete the conversion once and for all. Before accepting the job, I strongly advised the customer that I should be the last workman out of the door. 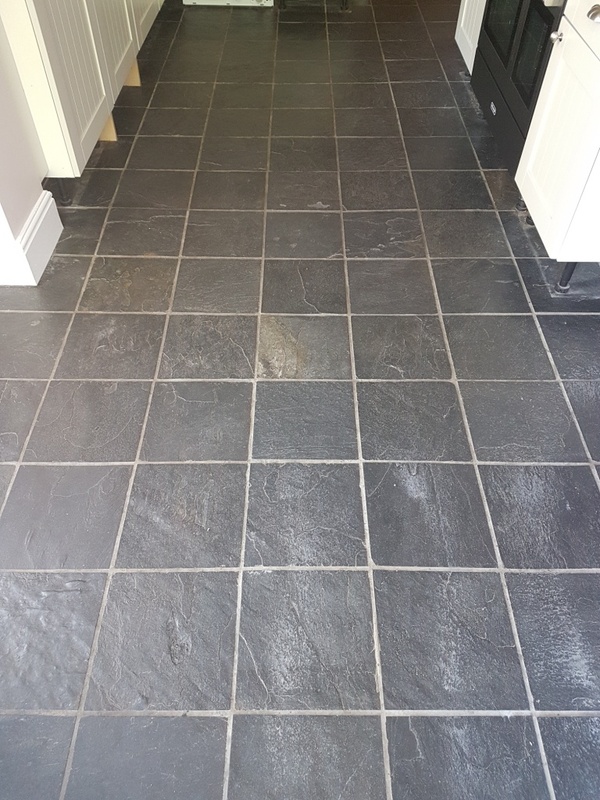 In my experience few tradesmen are known to take care of other peoples work and any further work being done in the property could potentially spoil the appearance of the Slate tiles. 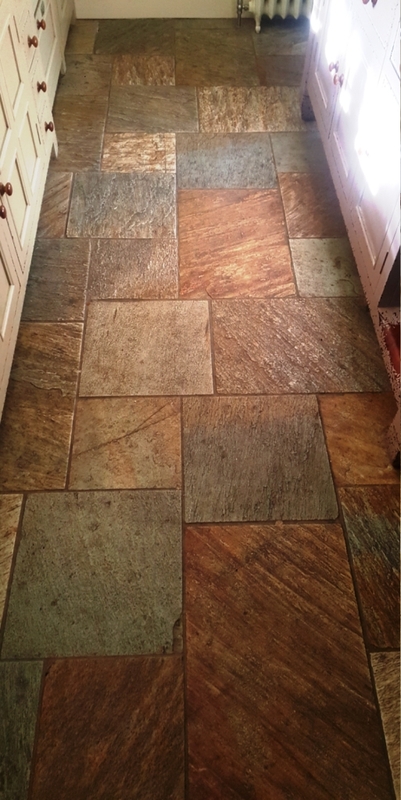 The customer was happy for me to proceed, so on the agreed date I returned and started the work by laying down a strong dilution of Tile Doctor Pro-Clean across the floor. Pro-Clean is an alkaline-based cleaner which breaks down all manner of dirt and grime. 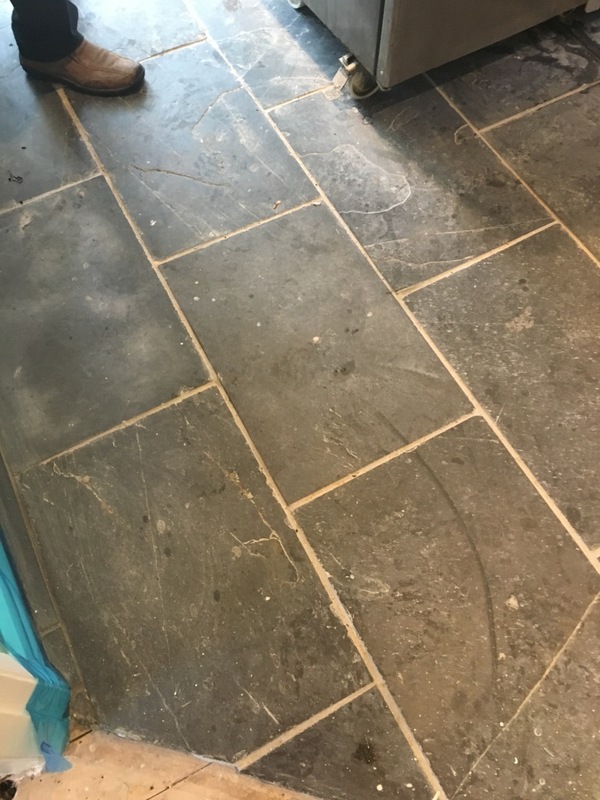 This was a large area of tiles, so I worked on individual sections of 3m2, first soaking the Slate in Pro-Clean and then waiting ten minutes for it to soak in and then following with a nylon black scrubbing pad fitted to a 17-inch rotary buffing machine to work the cleaning product into the stone. The tiles immediately came up looking much cleaner. Any excess water and chemical slurry was vacuumed up promptly with a wet vacuum. The tiler had done a good job of laying the floor and removing any excess grout as normally my next step at this point would be to give the floor an acid wash, but it wasn’t necessary. Once the tiles had been cleaned to the best of my abilities and given a thorough rinse, I left the property for 48 hours to allow any water that had seeped into the tiles to evaporate. This is important as excess moisture problems can prevent the tiles from being sealed correctly. On returning to the property a couple of days later, I swept away any bits of dust and debris and then proceeded to seal the tiles with Tile Doctor Colour Grow. 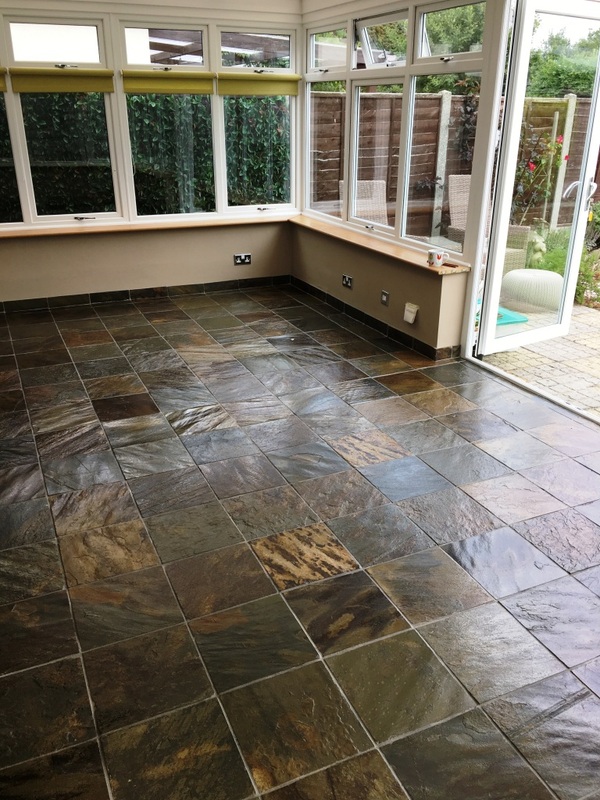 This impregnating, colour-intensifying sealer enhanced the stunning natural brown, gold and orange shades in the stone. Two coats of the sealer were applied to achieve a brilliant natural-look finish and robust protection against future wear and tear. 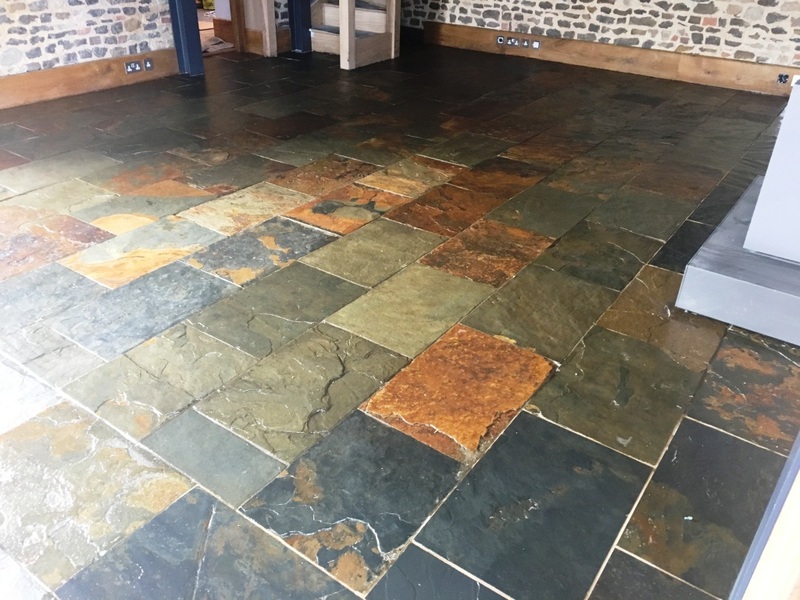 Restoring the appearance of these Slate tiles put the finishing touches on this fantastic barn conversion. Needless to say, the customer was very pleased with the results. 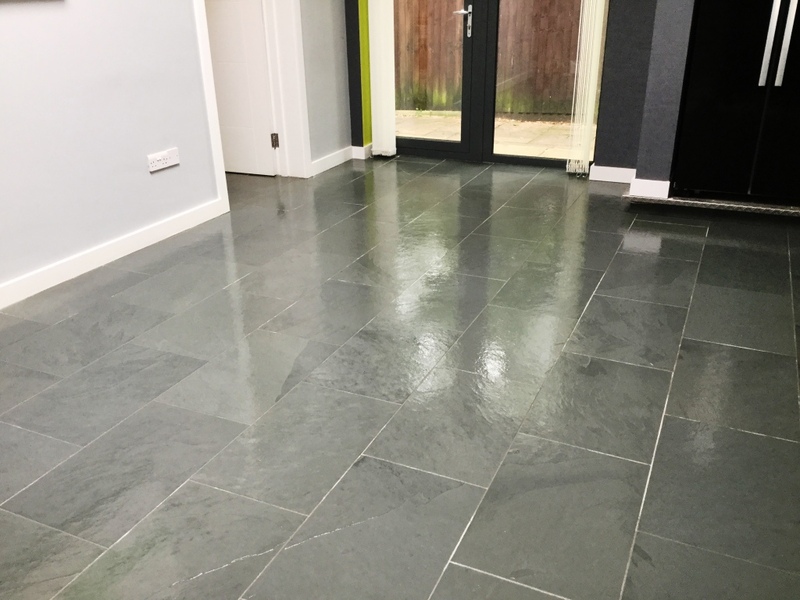 Brazilian Slate is amongst some of the highest quality available in the world and the grey variant is particularly striking when used for large areas of flooring. 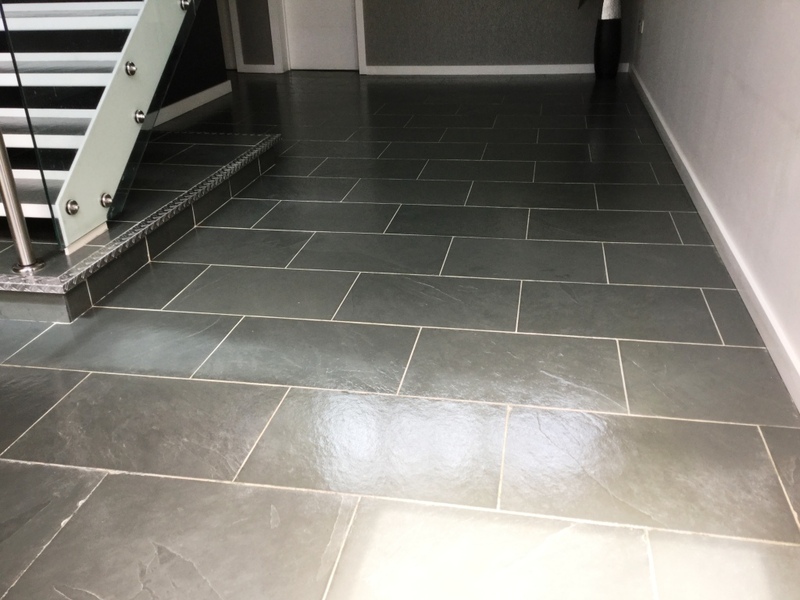 I mention this as I recently encountered a fantastic Grey Brazilian Slate tiled floor in what turned out to be one our largest domestic restoration projects to date. The floor, located at a property in the ancient, yet picturesque parish of Studham in South Bedfordshire, covered over 200m2. Unfortunately, it had been installed several years ago with very minimal sealant to keep it protected. 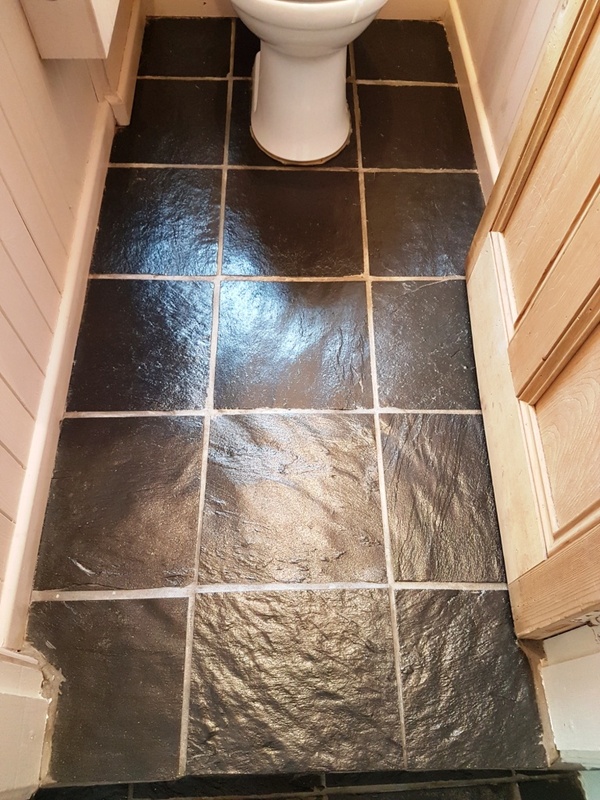 This sealant has since worn away and the tiles had suffered as a result. They have become ingrained with dirt, leaving them dull and difficult to clean. Thankfully, we at Tile Doctor are perfectly equipped to resolve these common and highly problematic situations. 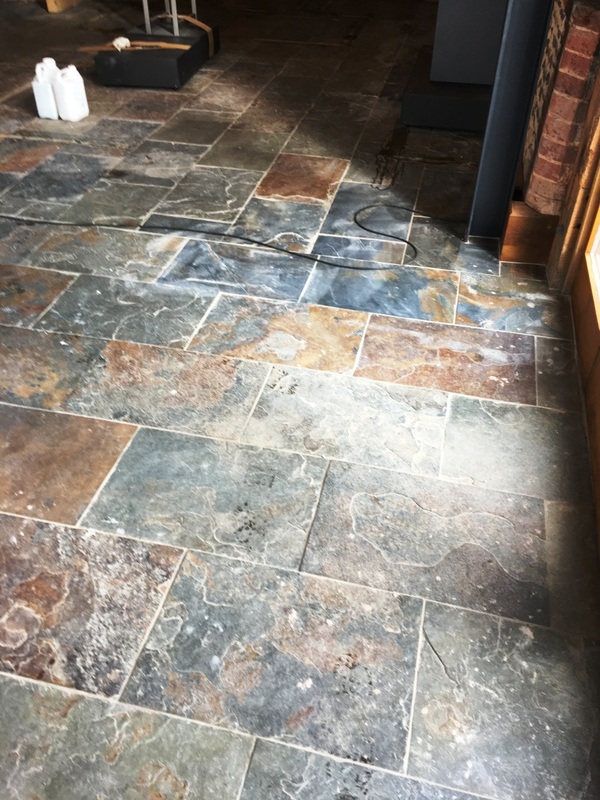 The owner was also concerned that areas of the hallway portion of the floor were missing grout and asked if this could be resolved as part of our restoration work. 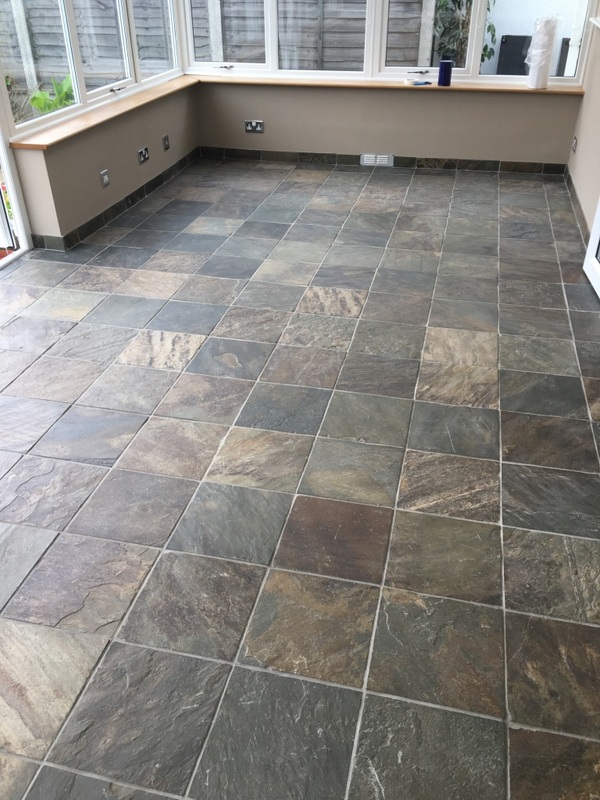 As I mentioned before it was a very large installation with slate tiles laid in four bedrooms, a large hallway with stairs, corridor to the kitchen and dining area, the kitchen and dining area itself, the utility room and the main sitting room. In short, it was no small area and I could envisage being there some time! Fortunately, the customer arranged to have all furniture moved into storage, so we could have a clear area to work on and were able to get straight to work on arrival. 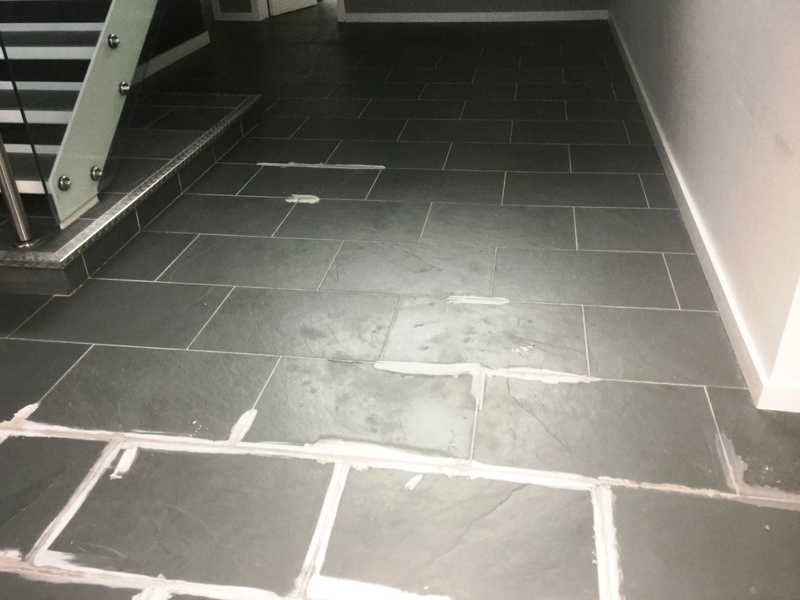 Due to the size of the job, the cleaning process was carried out over the course of four days by two Tile Doctor technicians on site. 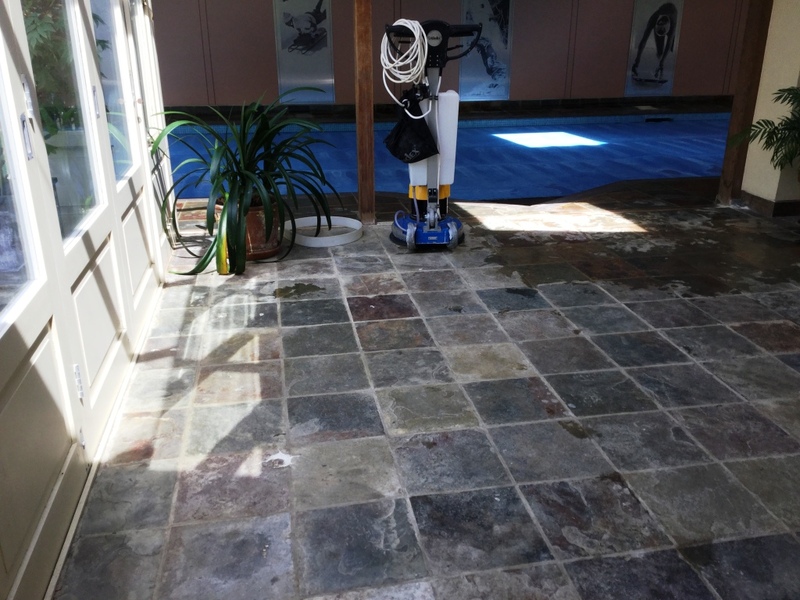 Our first course of action was to mix a strong solution of our reliable high-alkaline cleaner, Tile Doctor Pro-Clean. 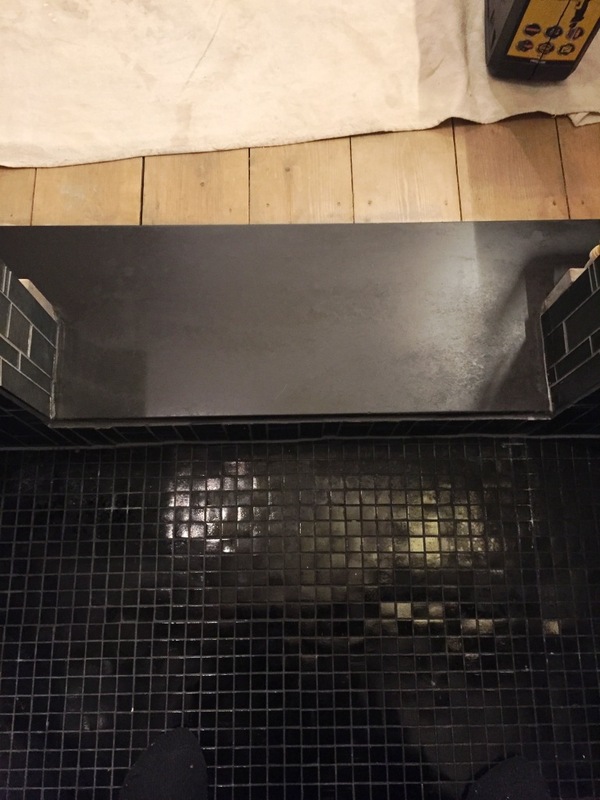 The solution was applied and agitated into the tiles and grout using specialised grout brushes and a rotary machine with a 17” black scrubbing pad. This not only cleaned the tiles but also removed any old sealant remaining on the floor. The resulting slurry was quickly soaked up using a wet vacuum. 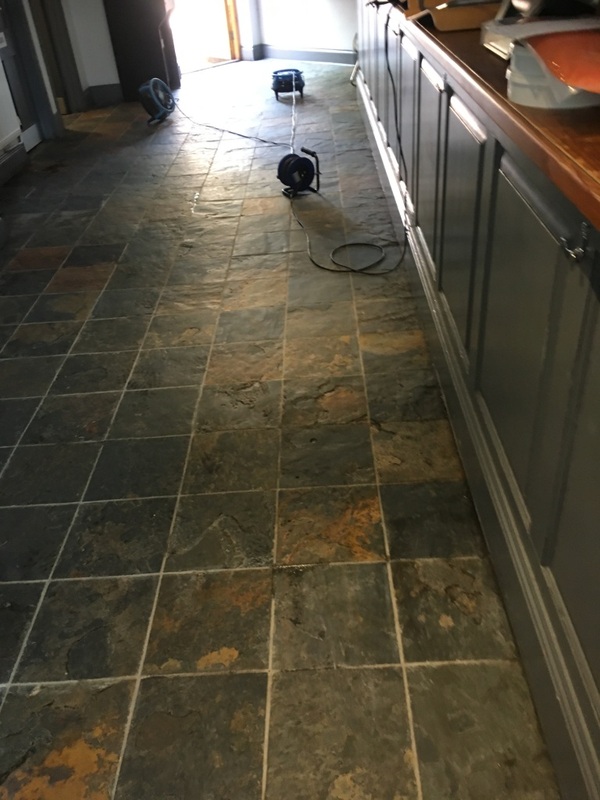 We then applied a dilution of Tile Doctor Grout Clean-Up to all the grout lines, brushing the product in with grout brushes and using the wet vacuum to remove any excess chemicals. Grout Clean-Up is a concentrated phosphoric acid cleaner which removes grout smears from the surface of the tile to ensure there’s nothing that can detract from its natural appearance. 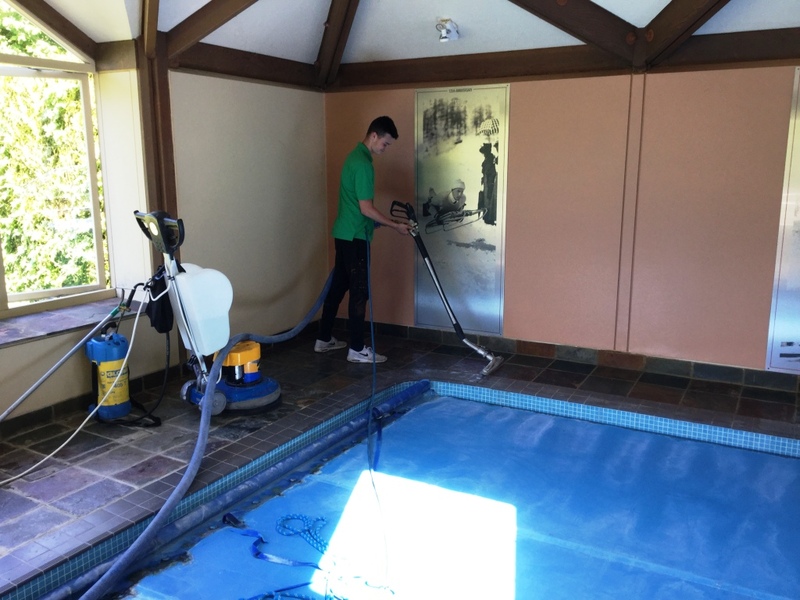 We rinsed and mopped the floor with plain water to neutralise the floor in preparation for sealing and performed a final go over with the wet vacuum. Each area was dried with fans and the cleaning process began again in the next room. This work was repeated in each area as we moved from room to room. Once the hallway was cleaned, the next course of action was to grout to the areas where it was missing. We did this by matching the colour to the original grout as best as possible. The new grout was then allowed to dry before any excess was removed and a quick clean was performed to avoid any grout haze. Each area was given at least 24 hours to dry before sealing and then sealed with five coats of Tile Doctor Seal and Go sealant. 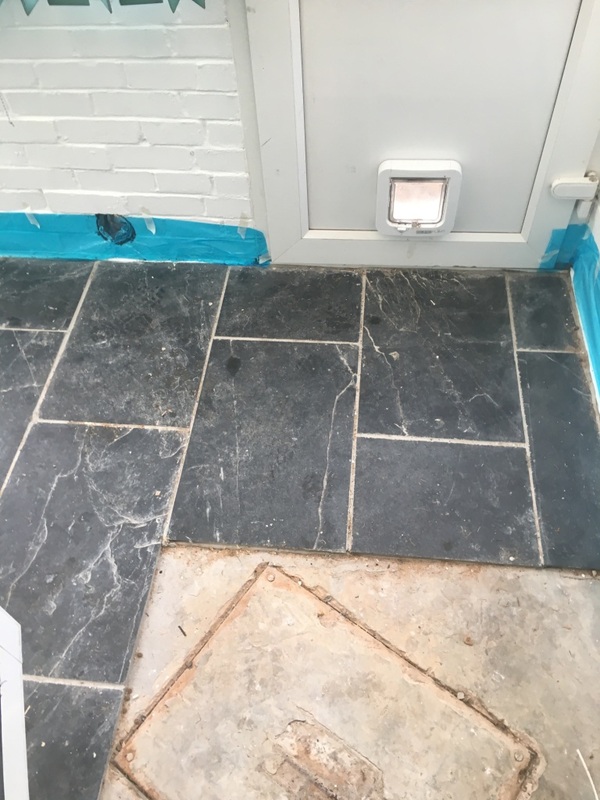 This sealer works really well on Slate adding robust protection whilst achieving a light sheen finish which gave the customer the look they were hoping to achieve. As I mentioned at the start of this post it was a very large floor and as you can imagine it took some time to complete but was well worth the effort. 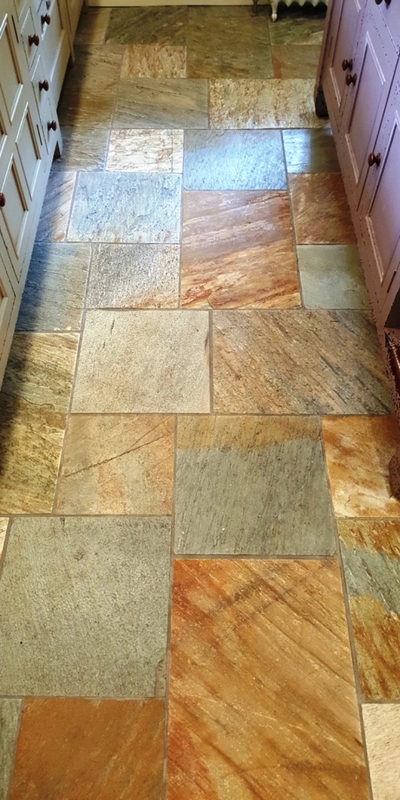 Stone and Tiled floors will degrade over time so much that they can appear to be simply beyond being restoration. 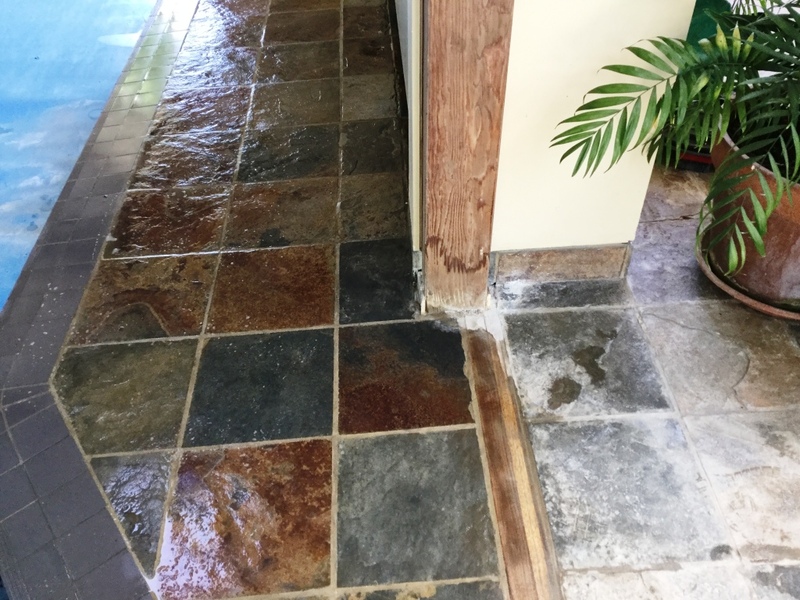 It goes without saying that years of neglect will do this to any surface but it’s worth knowing that the appearance of Tile and Stone can be extended when treated to routine maintenance using the right products and methods. 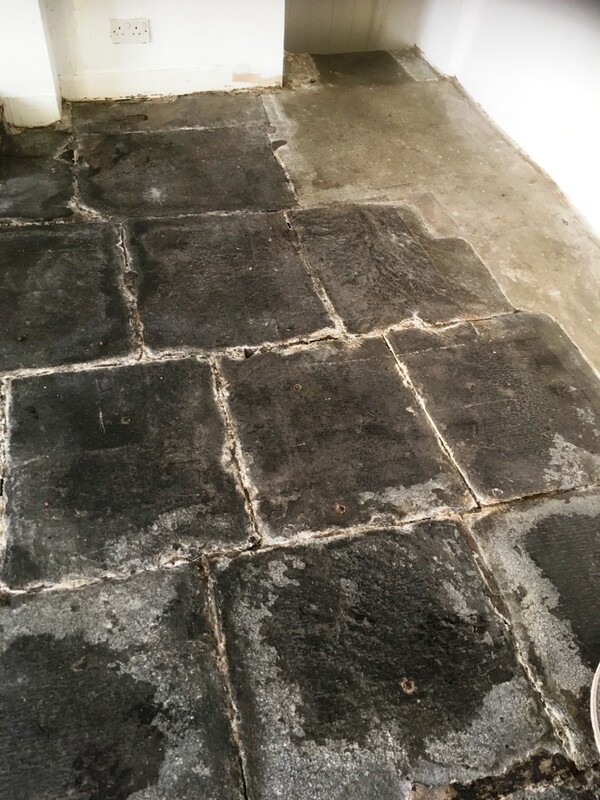 I’m sure many other tile cleaning companies had passed up on the opportunity to restore this Slate Flagstone tiles at a cottage in Hawkshead, simply because they did not feel they had the resources to make a good job of it. The tiles were in such a rough state that the property owner felt like there might be no alternative other than to rip them up and replace them. However, while the floor was certainly past its best, it remained secure. Some areas had been concreted to reinforce them, but the floor was mainly suffering from an aesthetic problem, rather than a structural one. 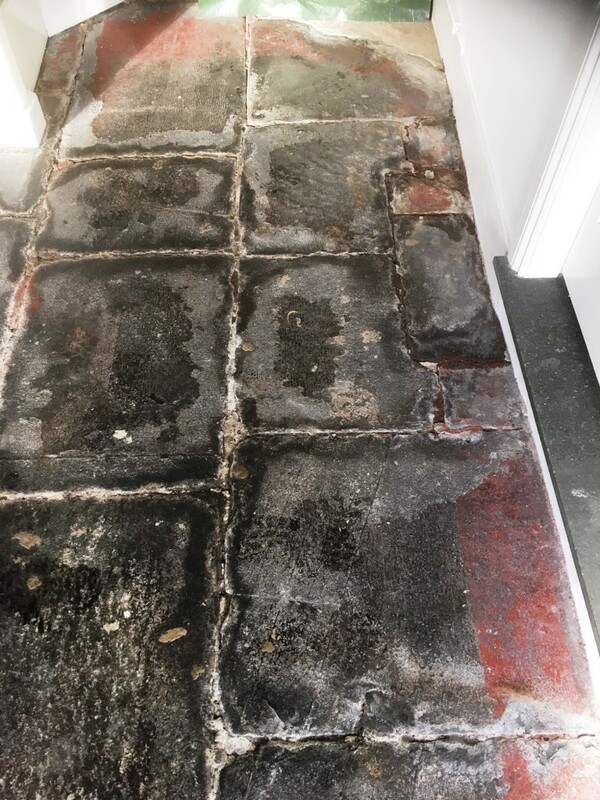 We knew that a general clean and seal job would not do the trick, but Tile Doctor have developed a system to successfully salvage tiles in these situations. It is called ‘Milling’ – here’s how it works. Milling is a process which uses very coarse diamond encrusted pads to remove the old, damaged surface layer of stone to re-face the stone with a new, smoother surface. This not only makes the floor look completely like new; it also makes it much easier to start cleaning regularly again to maintain its appearance for the long-term. Additionally, it means that we can successfully seal the stone to protect it against ingrained dirt and staining. 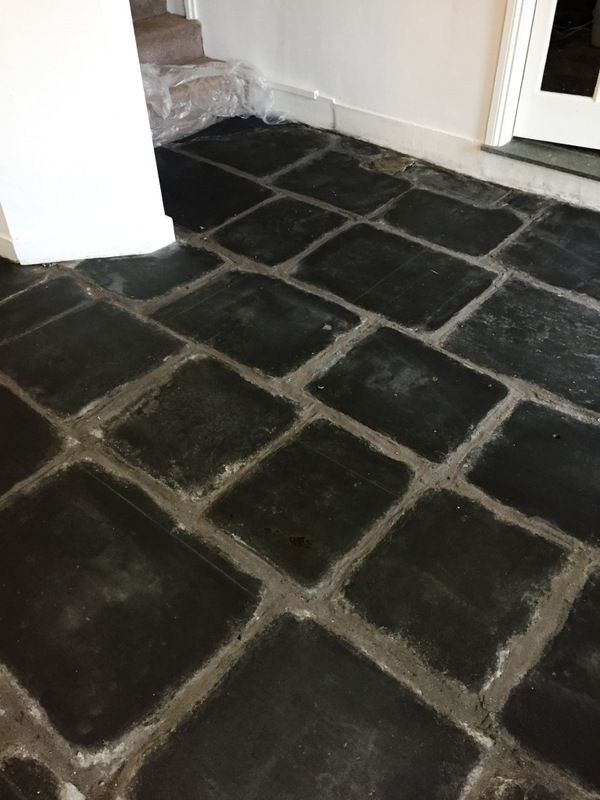 Once we had completed the milling process the stone and grout was given a thorough scrub with a dilution of Tile Doctor Pro-Clean agitated with a black scrubbing pad fitted to a rotary machine. This was needed to remove the soil generated by the milling process and also to ensure the grout was clean. Once done the soil was rinsed away with water and this was then removed using a wet vacuum. 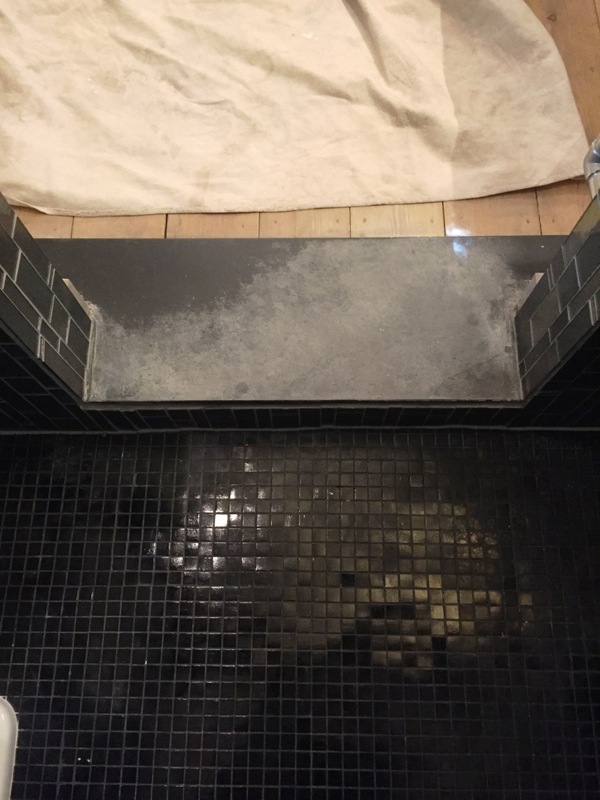 It had become apparent during the milling process that much of the grout had also failed so the next step was to rake out the grout and replaced with a flexible floor grout and the floor left to dry out completely. 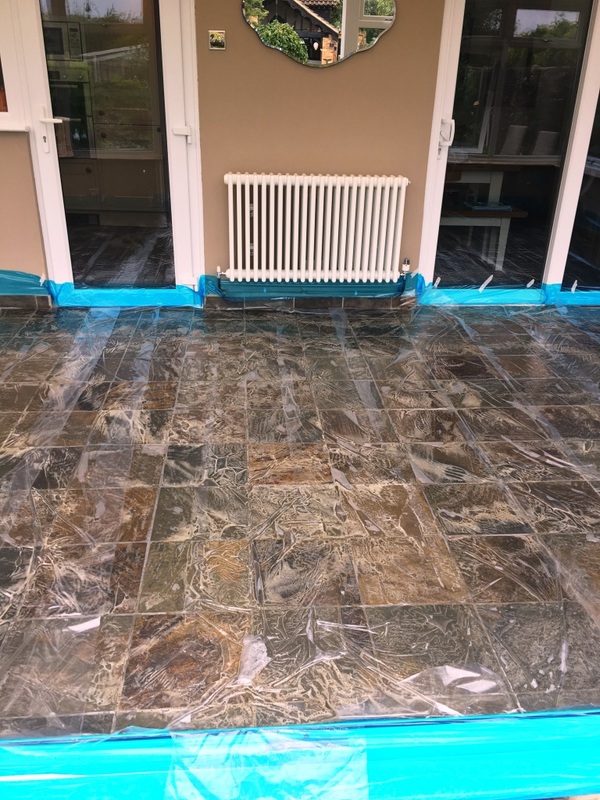 Since there was no damp-proof membrane present (due to the floor being very old), we sealed the tiles using Tile Doctor Colour Grow, an impregnating sealer that allows for moisture vapour transmission and therefore helps to eliminate damp issues. Colour Grow is also a colour intensifying sealer, so it really helped to elucidate the natural dark shades in the Slate. The outcome of the restoration is pictured below. The customer was absolutely amazed by the transformation and left the feedback below on the Tile Doctor feedback system. It can be hard to believe that floors which appear so far beyond salvation can be saved but this example goes to show that anything is possible with the right knowledge and techniques! 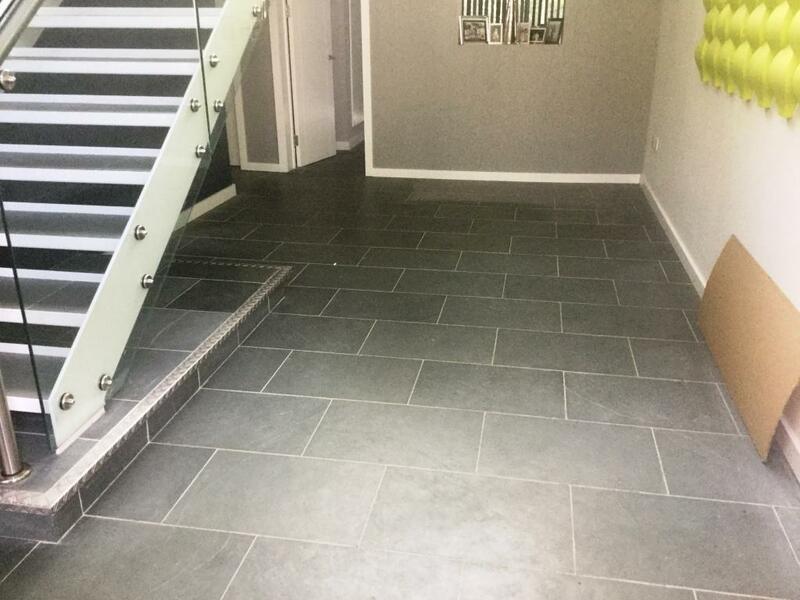 Slate is a very popular choice for floor tiles due to it being hard wearing with a relatively low porosity making it more stain resistant. 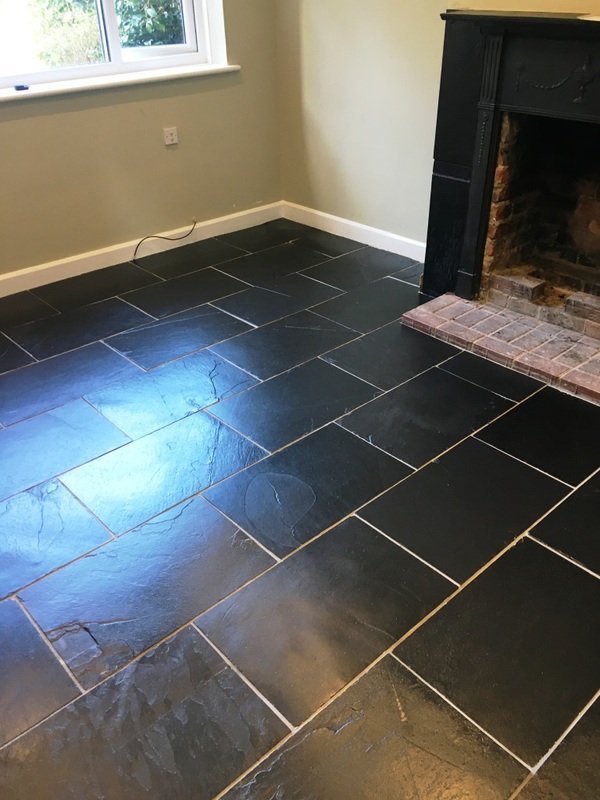 Some property owners opt for darker Slate, while others prefer wonderful multi-coloured Slate, such as that used in this kitchen in Datchworth, a small village in between the towns of Herford, Stevenage and Welwyn Garden City. What can be said for certain is that no-one likes a dull looking and dirty floor! 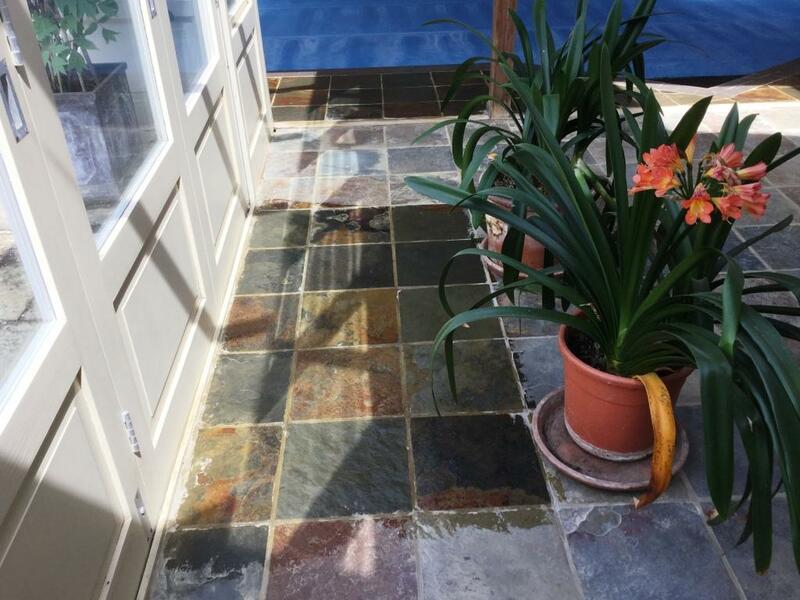 Unfortunately, Slate tiles can easily lose their lustre if not treated to routine maintenance. 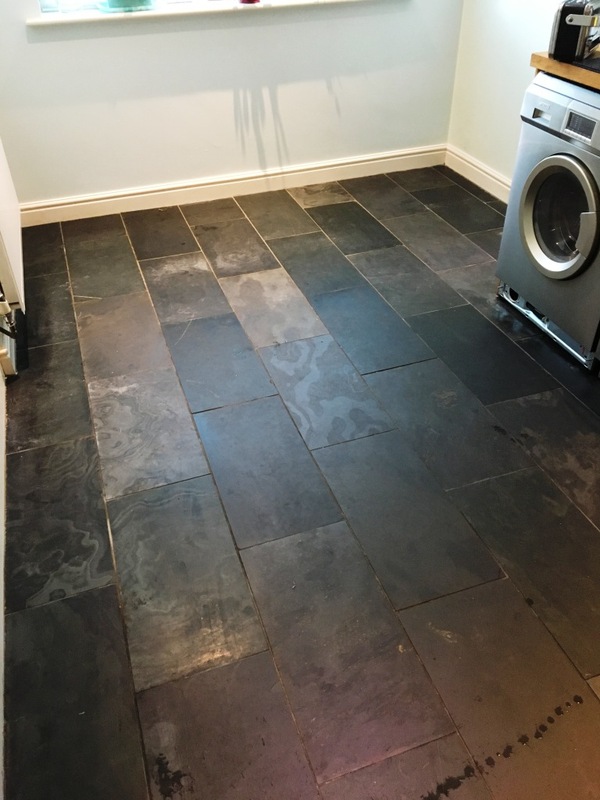 This customer felt that her Slate tiles, which covered the kitchen, utility room and a child’s playroom, were well overdue a refresh. Here’s what we did. 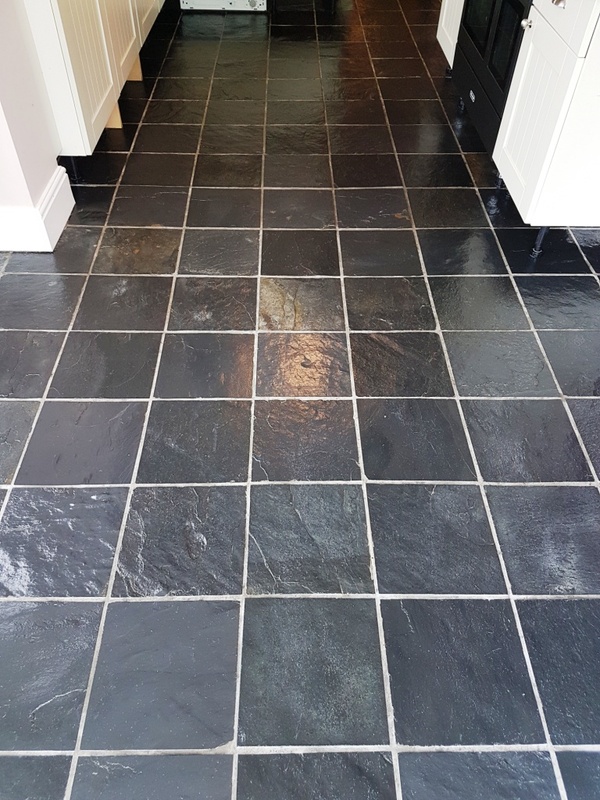 We followed our tried-and-tested process for restoring the natural lustre and appearance of Slate tiles. To begin, we removed any old sealant on the tiles using Tile Doctor Remove & Go, which is both a coatings stripper and cleaning product. 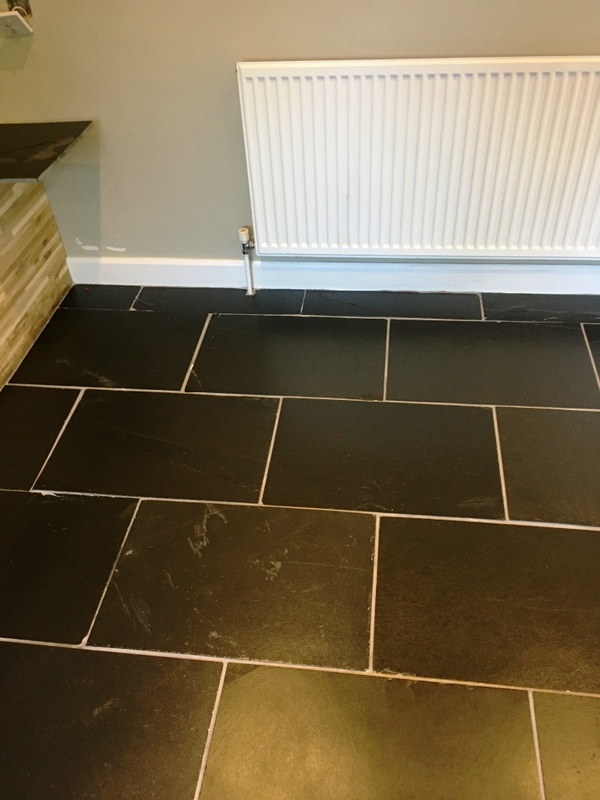 The product was applied liberally across the floor and worked into the tiles using a buffing machine fitted with a black buffing pad. Hand-held brushes were used to tackle the fine grout lines. 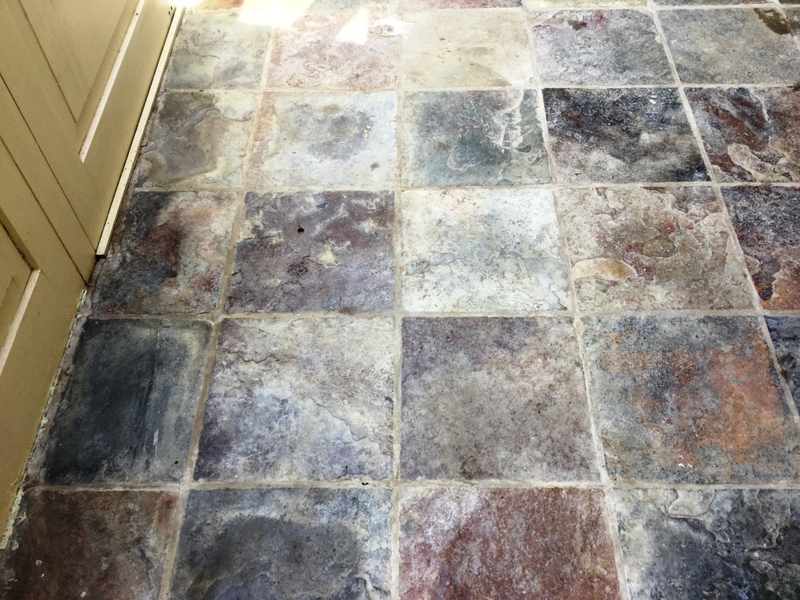 This process removed old sealers and gave the tile and grout an initial clean. 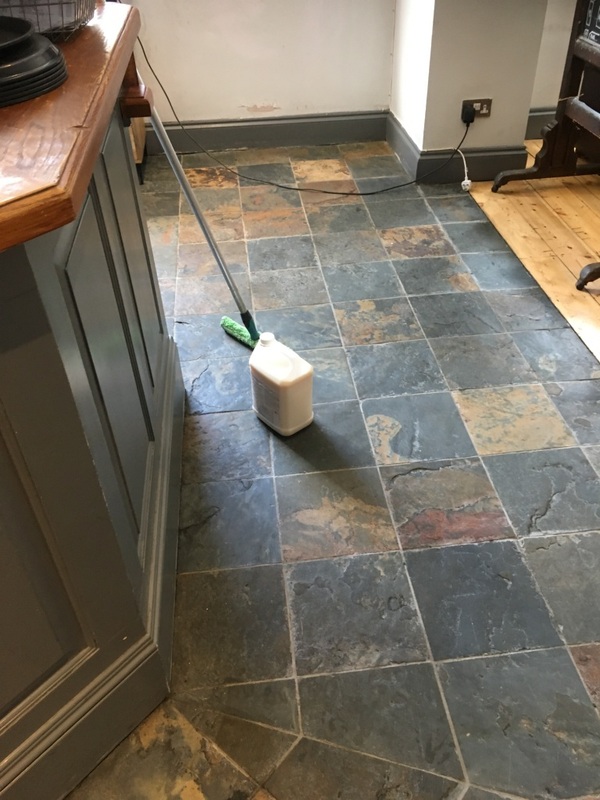 Next, we applied Tile Doctor Pro-Clean, which is our industrial strength tile and grout cleaner which was scrubbed into the Tile and Grout as before to remove remaining ingrained dirt. The resultant slurry was promptly removed using a wet vacuum. 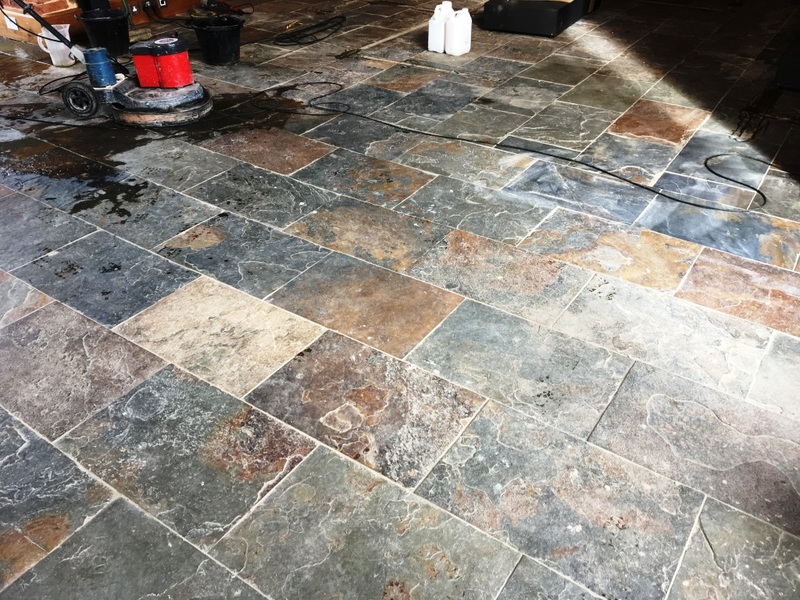 To complete the cleaning process, we steam cleaned the Slate to remove any further residue trapped in the pores of the stone and any trace of cleaning product. The floor was then left to dry off overnight so it would be ready for sealing in the morning. 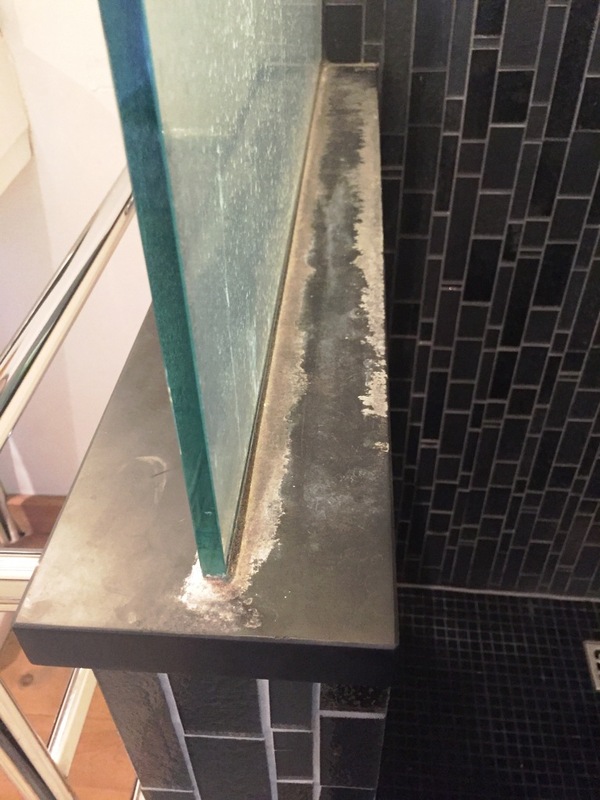 Upon returning to the property, we ran some quick damp tests, since even a small quantity of moisture can cloud the sealant and damage its performance. 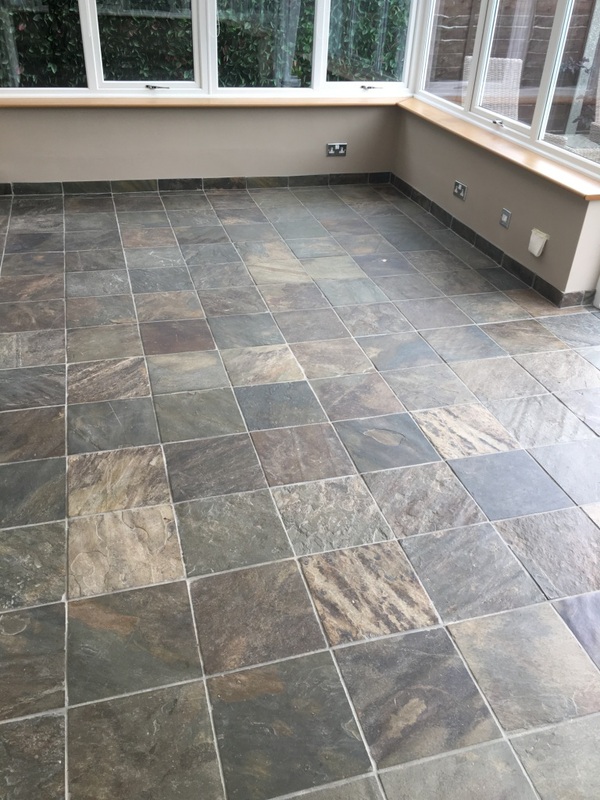 Thankfully, the tiles proved dry and we were able to seal the Slate using three applications of Tile Doctor Colour Grow. This impregnating sealer helps to enrich the natural colours in the stone, while offering a natural-looking matte finish and robust protection. 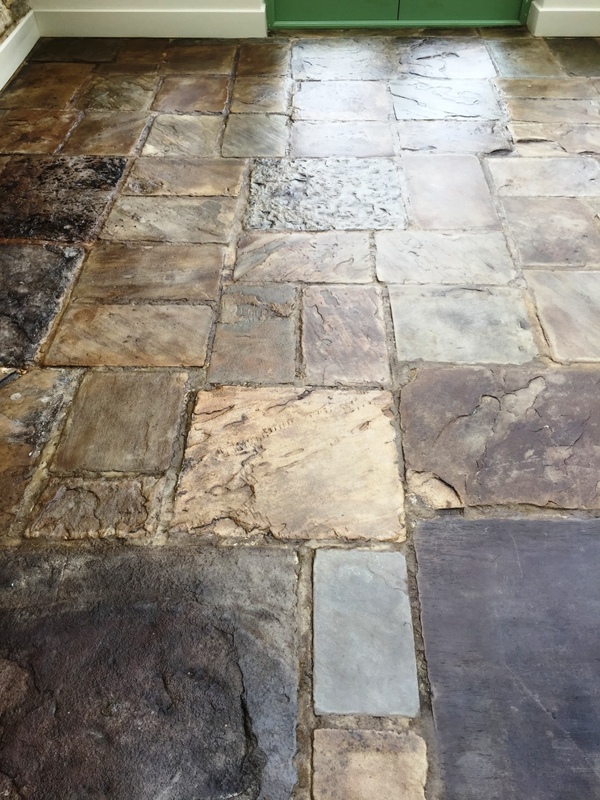 Between each application of sealant, we machine-buffed the surface of the floor to help dry the stone naturally while maintaining the matte finish. 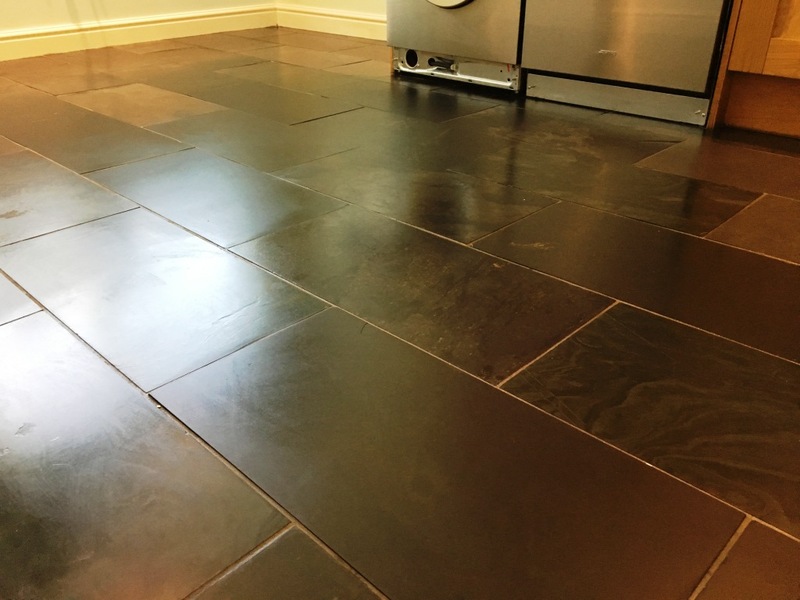 This two-day job was truly transformative for these Slate tiles. Just compare the before and after photos above – the customer was certainly very impressed with the speed and quality of the work. Another satisfied customer. The Drawing Board is a Gastropub and bar in Leamington Spa with a fantastic homely aesthetic. Leamington Spa itself is a spa town in Warwickshire, home to The Royal Pump Rooms, the most famous of the spa baths that were opened in England in the late-18th and mid-19th centuries. I have eaten at the Drawing Board a few times in the past (great food!) 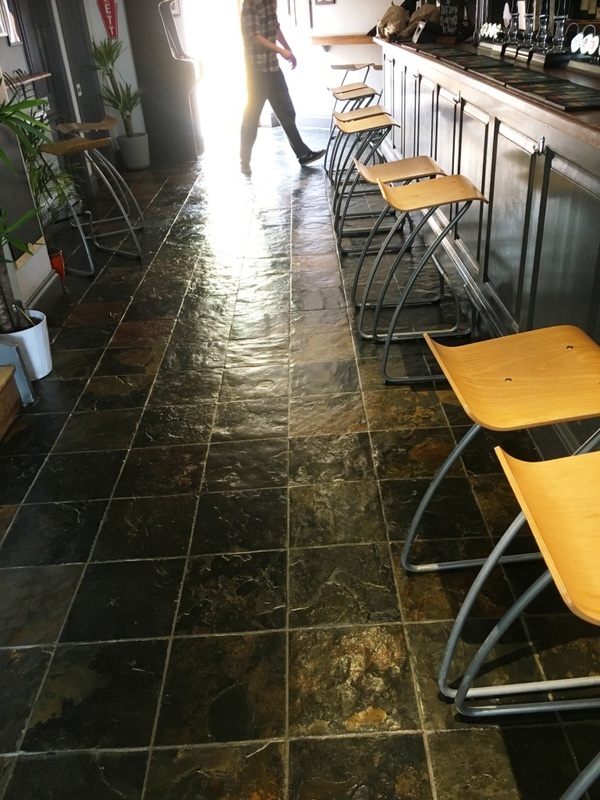 and was really pleased to help the owner rejuvenate the Slate tiled floor in the bar area. 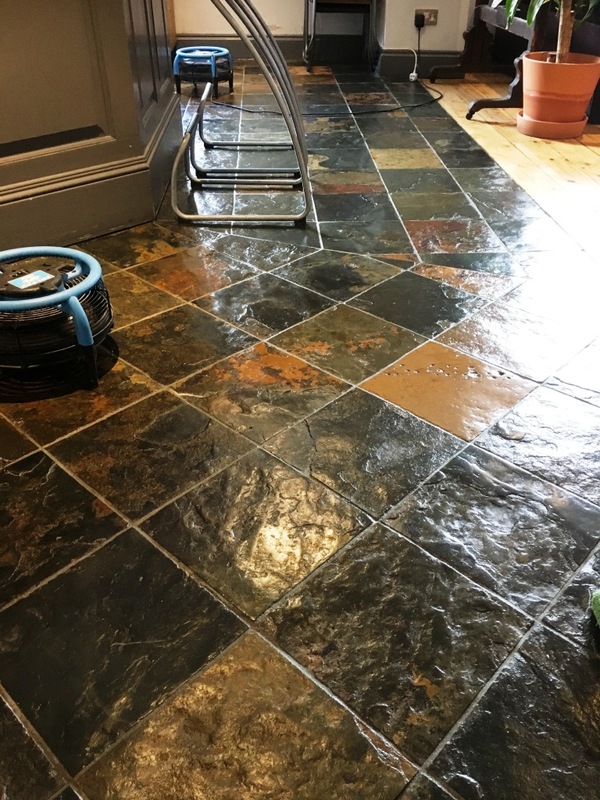 He wanted the area cleaned and sealed to achieve a wet-look finish, however, because the pub is very popular amongst customers, I would only have a period of five hours to undertake the work. This meant an early morning start. I had carried out some maintenance work on the floor about 18 months ago, but during this time it had suffered a lot of foot traffic. 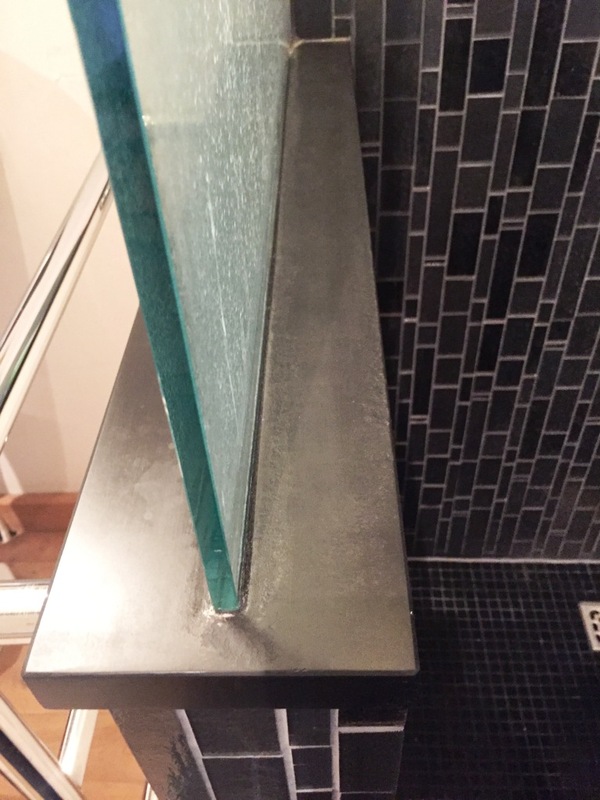 To begin, I used our product called Tile Doctor Oxy-Gel, which is an effective cleaner and coatings stripper, to remove the old acrylic coat on the tiles. Being in a gel form it’s easy to manage and holds in position allowing it to dwell on the stone and get to work on breaking the existing sealer down. Once applied it was left to soak into the Slate and then scrubbed in using a buffing machine fitted with a black scrubbing pad. The floor was then rinsed with water and the now soiled Oxy-Gel and water was removed with a wet vacuum. 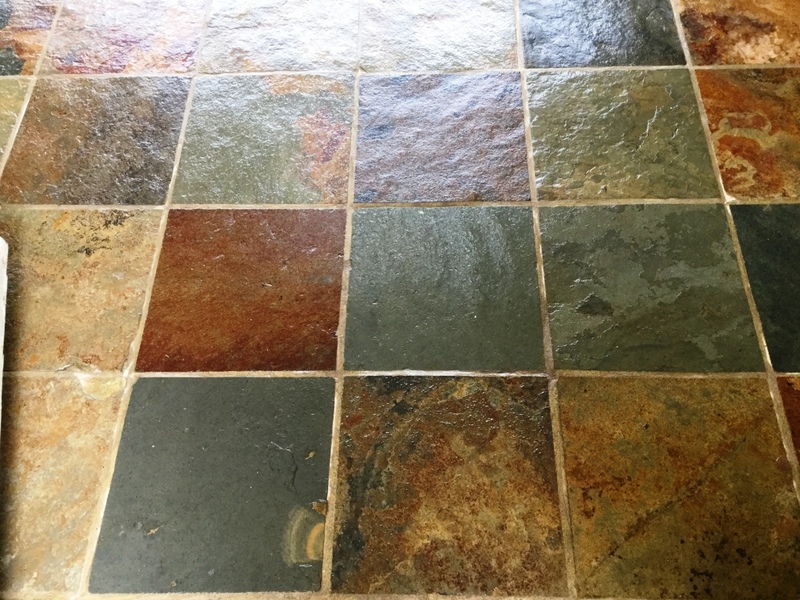 With the tiles stripped of any remaining coatings, I turned my attention to the deep cleaning the grout lines with Tile Doctor Pro-Clean, which is a strong alkaline cleaner. The product was diluted with water and then scrubbed in manually using a stiff brush. Following this, I rinsed the whole floor with fresh, cold water to remove any traces of product. Air movers were then installed to speed dry the stone as I needed to move quickly with only five hours to get the job done. 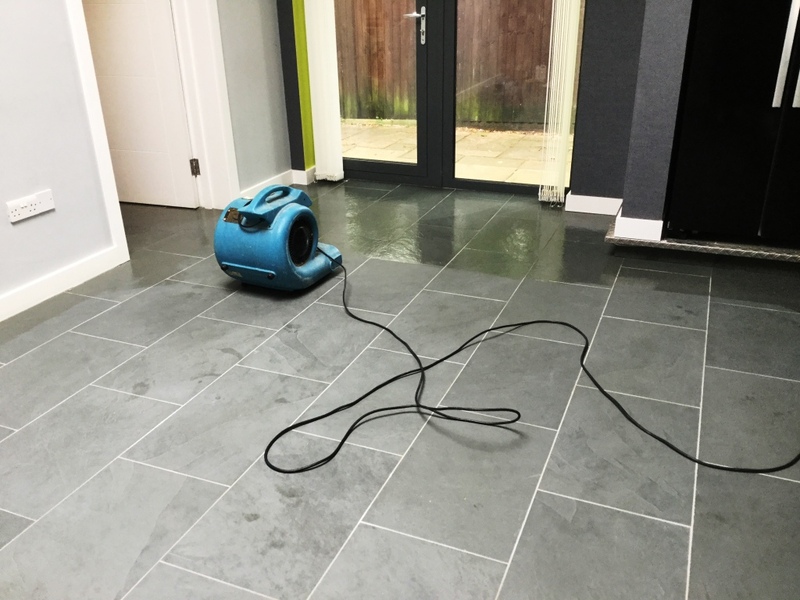 Once the floor was completely dry, I was able to seal it using two coats of Tile Doctor High Shine, which is a a specially formulated water-based blend of acrylic polymers designed to protect and enhance the appearance of natural stone whilst leaving a high sheen finish. Another advantage of the sealer is that being water based it leaves no smell as it dries which was important as being a pub we didn’t want to put the customers off. 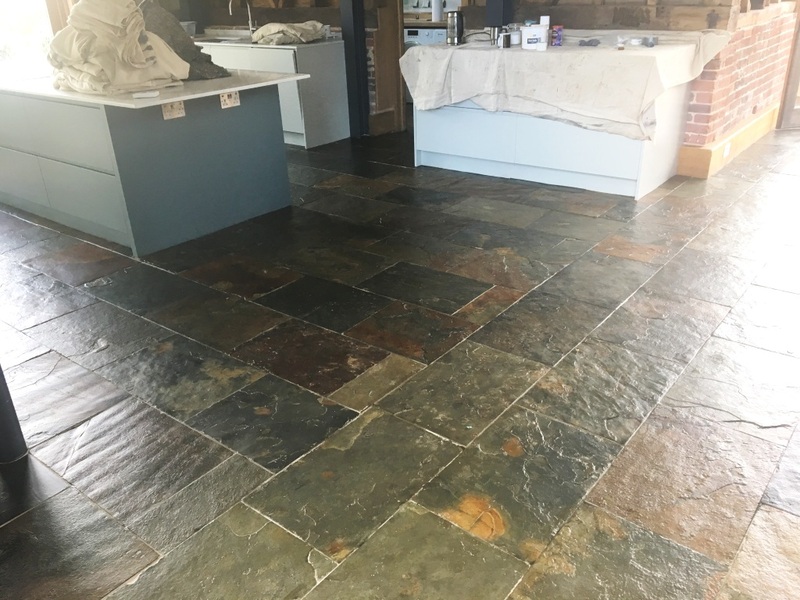 I think you will agree the Slate floor looks significantly better and the new sealer will provide them with the protection they need to withstand heavy foot traffic. The owner of the pub was very pleased indeed!